Hi, my name is Kristina, but everybody calls me Kris. Already when I was a young girl, I found much pleasure in giving massages to my family and friends, and so I made it my occupation. After finishing school in 1998, I attended a Medical Vocational College for three years, and since 2001 I have been working as a qualified physiotherapist/massage therapist. Until today, I attended many further training courses, and I am specialized in Deep Tissue Massage, Medical Massage, Lomi Lomi – Hawaiian Massage, and Foot Reflex Zone Therapy. I live for and love my job because every single day I am working miracles with my hands and put a smile on the face of the people I care for. 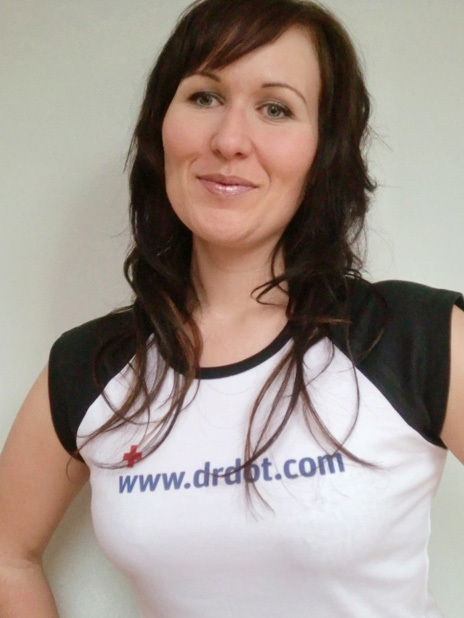 When I heard for the first time of Dr. Dot’s International Massage Team, I was totally excited. I had an audition and shortly afterwards I was employed. To be a Dot Bot brings together love for my job, music, travelling and the opportunity to meet interesting people. I am very proud being a part of her awesome team. I am available for you all across Germany, and I would also be glad to accompany you during your national or international tour. Looking forward to see ya!